As part of my summer app exploration I went on the hunt for a better blogging app. You see as an avid WordPress user I have constantly been looking for a good effective app to blog on the go using the iPad the iPod Touch or the iPhone. I have never been particularly fond of the official WordPress app – yet have used it in lieu of an alternative for quite sometime. Everything in the editing interface displays HTML code and does not allow for real photo previews. Although I am quite proficient in HTML coding I do not want to look at it when I am posting quickly on the go. You really only refer to the HTML code when there is an issue or there is a need for some tweaking. I have also found it very clunky when I want to add a YouTube video. For example, I would have to double tap my home button, tap the YouTube app button, open it up, and navigate to the video that I would like to have. I would then locate the code, double tap, go back to the WordPress app and paste the code in. This app to app jumping to get codes and links is very cumbersome. And, once again, pasting it in the editing window of the WordPress app only shows up in HTML code. I also don’t understand why I can’t podcast directly from the app itself but that’s cause for another blog post. My search for a better blogging app landed me on TinyDesk Writer about a week and a half ago. I can honestly say that this application is awesome and although only an iPhone application at this point it really is quite powerful and better than the official WordPress app itself. The TinyDesk app shows blog titles beautifully with thumbnails and a very lean, beautiful interface for viewing posts themselves. I particularly enjoy the drag-and-drop editing in layout view. The ability to add new elements to the blog post such as a next GEN gallery photo albums pictures for quotes is as easy as pie and very intuitive and very visual. Another favorite component of mine with this particular app is the ability to access the media library from the WordPress blog itself. This enables the user to access images that had already been uploaded to the WordPress blog previously and, therefore, make them available to use again without having to upload them again. I must say that I was a bit disappointed, however, when at @mrjarbenne and I asked the developers a few questions on Twitter and received no response. At this point we were a bit concerned that the app was no longer being developed or supported as there have been a tweet from the developer in about 90 days at that point. As great as I think this app is there was still something inherently missing, which led me to continue my journey to find a better blogging app. On my journey I did download another blogging platform called BlogPress. I wasn’t too impressed with this particular app as it really did operate almost exactly the same as the WordPress app. The only difference that I could find was that it did allow for the use of a variety of different platforms rather than just the WordPress platform itself. So the interface itself was not very pleasing to me and that was $4.99 I wish I didn’t spend. I now, however, can tell you that I have found what I consider to be the best and most fun blogging app available in iTunes for the iPad. May I introduce you to Blogsy (@BlogsyApp on Twitter). This app is the real deal and makes blogging super super simple. For example, you can add your individual YouTube, Google Picasa, or Flickr account and easily drag pictures from the interface directly to your blog post – drag-and-drop functionality – that’s right drag-and-drop functionality from YouTube, Flickr, Google Picasa, Instagram, and Vimeo. This feature alone is a huge timesaver and completely eliminates the need to leave the app at all. Did I mention drag-and-drop YouTube videos? Here’s a demo video for Blogsy. There are many more that can found with a search on YouTube for Blogsy. For more on Blogsy, check out this amazing review and tour of the app at appstorm. 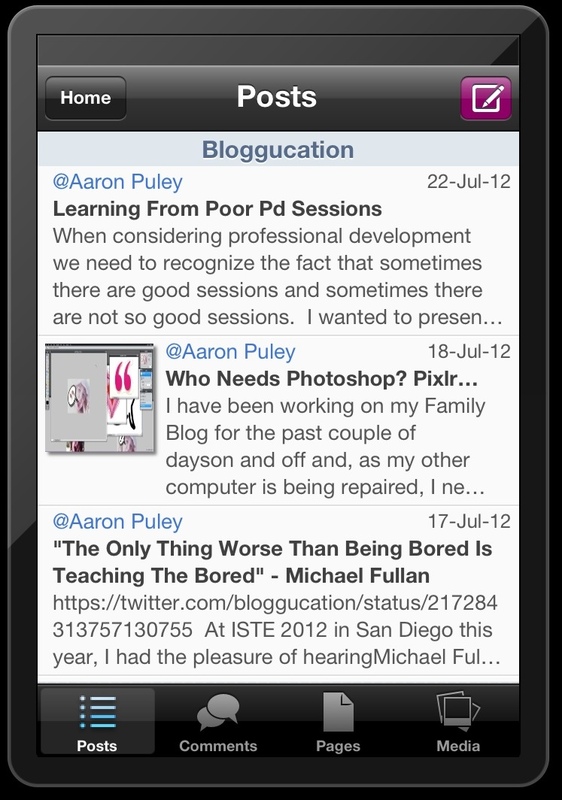 Blogsy is available in the app store for $4.99 and, in my humble opinion, is worth every cent. I love your post and reading about your blogging app journey. I honestly cannot thank you enough for introducing me to Blogsy. I’ve tried for a while now to find a blogging app that I like, and to be honest with you, I kind of gave up and decided to just blog on my laptop. It was always so hard to insert media, and I like including photographs and videos in my blog posts. With Blogsy though, it’s as simple and dragging and dropping. I think I may actually blog on my iPad now. Thanks Aaron! I’m so glad that this became your summer goal, and that you shared your findings with others too! I think it should be a wake-up call to the WordPress Mobile team, in a year when Matt has stated quite clearly the importance of mobile (FF to 21 minutes in on the video here: http://ma.tt/2012/08/state-of-the-word-2012/), that they don’t have the best app on the market for their own platform. Hopefully they are aware of the innovative possibilities. Blogging from mobile should be as easy or easier than blogging from a desktop. HTML should hover behind the scenes, like the OS I know exists in the background but doesn’t require me to interact with a C:/ prompt in order to initiate actions. I really like Blogsy. I also really like competition, and hope the focus from the head of Automattic pushes the entire platform (web interface) in the direction that this app clearly shows is possible. Clearly we have a ways to go. Attempting to post this comment on your blog from an iPhone was a nightmare of pinching and zooming. Going back to proofread the work is almost impossible. I love Blogsy, but it’s not available for iPhone – only iPad. Don’t want readers to get annoyed if they purchase it expecting this. Thank you so much for bringing this to my attention – that is definitely a faux pas in my review … I will go in and change that right now thanks once again for your comment. I love Blogsy. I started toying with it a few months ago and now publish most of my posts using it. Besides being an app that works, the other great thing about Blogsy is the way the developers communicate with their users. Enjoyed your post. Thanks, Diana! I too am particularly happy with the developers. I had some issues posting early because of the WPMU privacy plug-in which was not allowing my blog to connect to Blogsy. I commented to the developer via email and I received a prompt reply. Very impressed indeed! You can find more info here: http://blogpadpro.com Hope this is helpful! Thanks, Mary. I’m going to check it out. I love Blogsy but am a sucker for a good app that makes blogging the magic it can be. 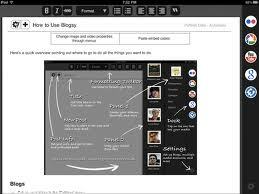 I’ve used Blogsy and its a great app but I’m currently using Blog Pad Pro. It just suits my needs a little better than Blogsy.